Jeep SUVs are known as some of the most capable vehicles available. While most drivers will be thrilled with the off-roading prowess of a new Toyota RAV4 or the comfort of a Highlander, we also understand that some drivers want to focus on capability at the expense of other things. For those drivers, we’ve got some used Jeep SUVs that will fit the bill without breaking the bank. 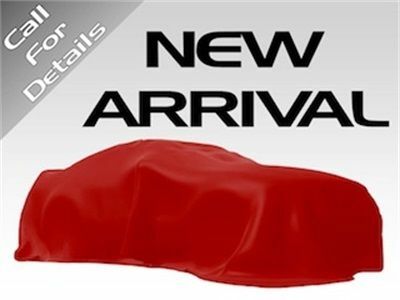 Just take a look at the pre-owned Jeeps we have in stock. 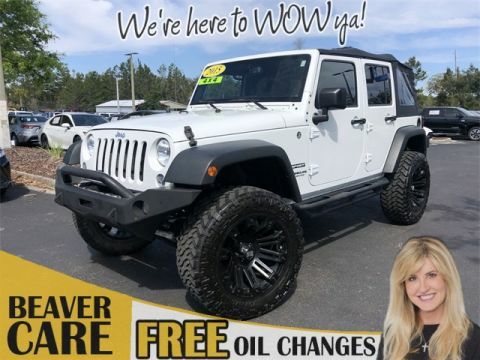 Bright White Clearcoat 2015 Jeep Wrangler Unlimited Sport 4WD 3.6L V6 24V VVT Bright White Clearcoat 2015 Beaver Jeep Wrangler Unlimited Sport is a 4D Sport Utility 4WD . This Florida SUV has a 3.6L V6 24V VVT engine. Call right now and schedule a test drive. 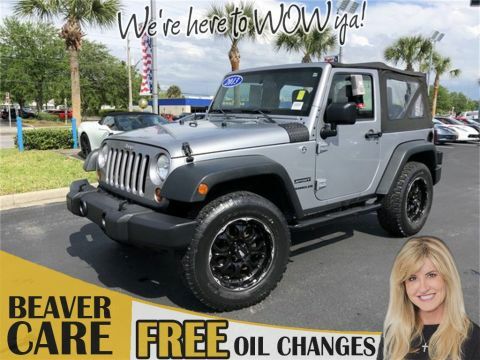 Ask for stock number 648493, the Florida 2015 Beaver Jeep Wrangler . Shop Us Online at www.beavertoyotastaugustine.com. Serving Jacksonville, Palm Coast, Daytona, Gainesville and St Augustine. Beaver Toyota St Augustine on 2995 US Hwy 1 South in St Augustine. CARFAX One-Owner. PRISTINE CONDITION, Bluetooth Handsfree, NO ACCIDENTS ON CARFAX REPORT, One Owner, NONSmoker, Local Trade, MUST SEE!, Fresh Oil Change, Passed 160 Point Toyota Certified Inspection, Passed Dealership Inspection, Freshly Detailed, MINT CONDITION, EXCELLENT CONDITION, THE NEWEST IN CAPTIVITY ,YOU WONT FIND ONE THIS NEW ,ONLY AT BEAVER TOYOTA IN ST AUGUSTINE WE HAVE THE ONLY HANDPICKED USED CARS IN THE COUNTRY! !, ABS brakes, Compass, Electronic Stability Control, Low tire pressure warning, Traction control. 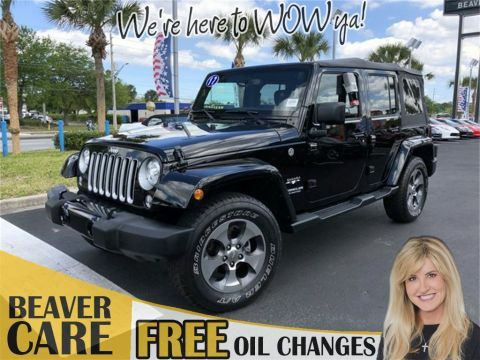 Tank Clearcoat 2016 Jeep Wrangler Unlimited Sport 4WD 3.6L V6 24V VVT Tank Clearcoat 2016 Beaver Jeep Wrangler Unlimited Sport is a 4D Sport Utility 4WD . This Florida SUV has a 3.6L V6 24V VVT engine. Call right now and schedule a test drive. Ask for stock number 200002, the Florida 2016 Beaver Jeep Wrangler . Shop Us Online at www.beavertoyotastaugustine.com. Serving Jacksonville, Palm Coast, Daytona, Gainesville and St Augustine. Beaver Toyota St Augustine on 2995 US Hwy 1 South in St Augustine. Why Buy a Used Jeep SUV from a Toyota Dealership? While we think that a new or pre-owned Toyota will suit the needs of most drivers, we pride ourselves on giving our customers as many choices as possible. Independent of that, we go out of our way to make the car-buying process great, and we do this with The Beaver Wows. Among other benefits, we offer a 5-Day Used Car Exchange Policy, and we strive to be fast, fair, and transparent throughout. So even if you decide you want a used Wrangler—which Edmunds calls “all but unstoppable on the trail”—you can still benefit from the incredible customer-service experience that we offer each and every day. 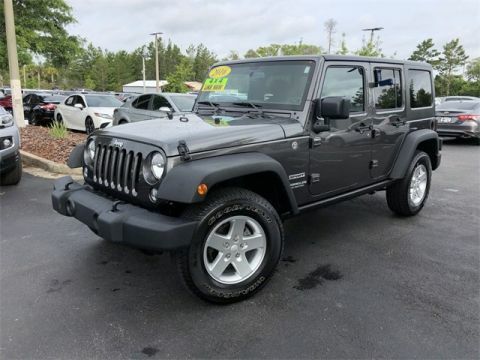 Want to check out our used Jeep SUVs for yourself? Just come to Beaver Toyota of St. Augustine at 2995 US Highway 1 S.